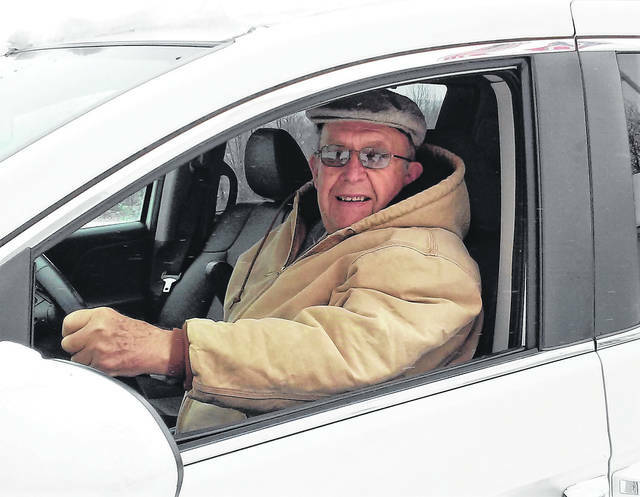 Jim Georges of Hillsboro will celebrate his 81st birthday in March, but that doesn’t keep him from being a volunteer driver with the American Cancer Society’s Road to Recovery program. The free service pairs up volunteer drivers with local cancer patients who need transportation to and from clinics and hospitals for radiation and chemo therapy treatment. Hillsboro resident Jim Georges is one of the local Road to Recovery drivers for the American Cancer Society, and at 80 years of age he told The Times-Gazette that for him it was personal. Transportation is one the biggest barriers when it comes to people getting to cancer treatment, but Heather Robison, who coordinates all patient programs for the ACS in southwest Ohio and Northern Kentucky, described their Road to Recovery program as a way to eliminate that concern for those fighting the disease locally. She described the free service as a tremendous help to patients who don’t have the resources to travel for their treatment, and said that some cancer patients have been put in the position of having to forego getting radiation or chemo therapy treatment because they don’t have a way to get to the hospital or clinic. Georges has been a volunteer for about 10 years, driving cancer patients to wherever their doctor has sent them for treatment, be it the Adena Health System in Chillicothe, the Boyd Cancer Center in Wilmington, Christ Hospital, UC Medical Center in Cincinnati or other clinics in southwest Ohio. He recently received a congratulatory item from American Cancer Society thanking him for making 50 trips, but said he kept a notebook record that showed he actually made more than 100 outings over the past decade. Being a Road to Recovery driver is literally as simple as driving a car, Robison said, with volunteers that are screened and trained to pick up cancer patients who sign up for the program. She said the program relies heavily on volunteers, and that ACS has nearly 10,000 Road to Recovery drivers nationally, but the need for drivers is greater than the number of volunteers. The requirement for volunteer drivers is that they must be between the ages of 18-85, own a safe and reliable vehicle, and be able to keep patient commitments. She said there is also a brief training program that can be performed online and that prospective volunteers must submit to a background check, which is provided free of charge by the ACS. Robison said that whether it’s being a volunteer or a patient seeking help with a transportation need, people can go to Cancer.org/roadtorecovery or can call 800-227-2345 for more information.